Home » Other » Are You A Successful Person? Success can be measured in many different ways. Typically successful people regardless of how success is measured have similar traits. When I get discouraged, frustrated, upset or anything like that, I always refer back to this. It reminds me of what I need to keep doing to get back on the path. (Don’t get me wrong, we all have bad days). If you find yourself doing things on the “unsuccessful people” side, that’s ok – we all start somewhere. I recommend that you start reviewing your behaviour and try to slowly ensure your behaviour mimics the “successful people” side. Once you get in the right mindset and have the right habits, things typically get easier. Most people would rather work with someone with a “successful people” mindset opposed to one with a mindset of “unsuccessful people”. Things will tend to just fall into place. You will also tend to attract other successful people which in return will help you as well. If you have the “unsuccessful people” mindset, you will likely shut out others and while you may not be helping others and see this as no negative impact to yourself – remember that others will not be helping you either! And, if you don’t think you need help, maybe you don’t, but at the same time, think of how much better off you would be if you had input and ideas flowing in from others? Not all will be great, but every once and a while you might get something good. In the end, you can decide on how you want to conduct yourself. 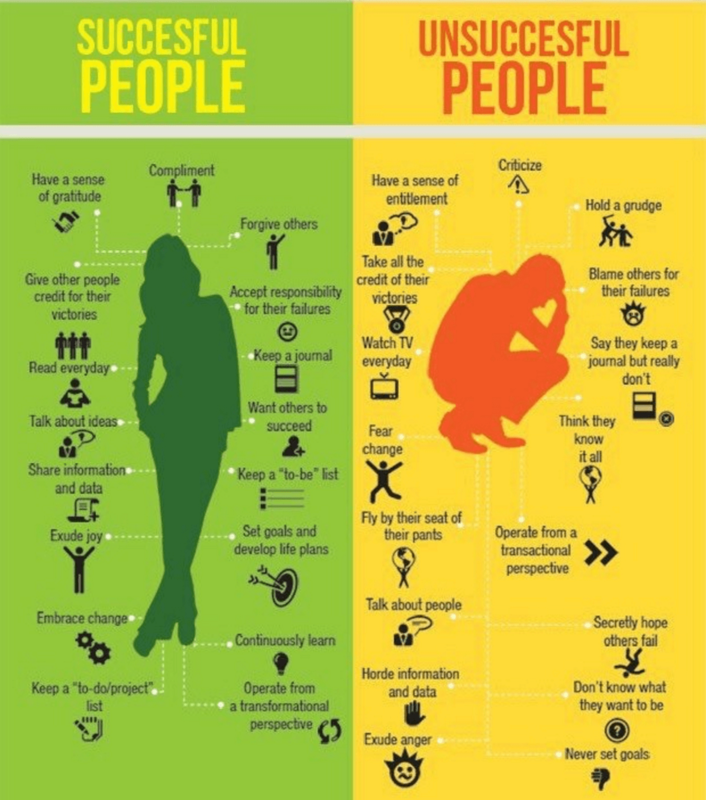 You might consider yourself successful (you may even be successful depending on how you are measuring), but I guarantee you could be so much more successful if you follow the traits outlined in the “successful people” portion of the image!